Lissette and Sean met at school and knew they were meant for each other right away! Their friendship quickly grew to a beautiful romance that eventually turned into a proposal. 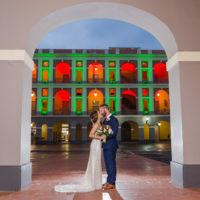 Their love for travel, culture, and Puerto Rican food made them quickly decide they would have their wedding at Puerto Rico. This was an early 2017 wedding that I missed to publish after the Hurricane Maria interrupted my sacred bi-weekly blogging routine! So here's a throwback to Sean & Lissette's day! When asked about their favorite wedding choices, they mentioned: their spouse, Hacienda Siesta Alegre, getting a band, getting good food, and having me as a photographer *blushes*. This list, as common as it may seem, did not mention too many frills, just relationships, happy moments, and someone to capture them. And that was exactly what their wedding was about. I arrived a few hours before the ceremony, to find Sean and his groomsmen playing pool table on one of the terraces of the Hacienda. However, when I arrived, Sean got a little nervous, as there was a gift from Lissette waiting for him. It was a letter, which words I do not know, but I do know they were incredibly touching for him. After a little alone time, I took him back with the groomsmen so we could do a couple more portraits. Then, it was Lissette's turn. She was happy, glowing, so excited! I think one of the things they were looking forward to the most, was their almost-first look. Where Sean would wait by the corner for Lissette to hold her hand while they had a moment of prayer together before the Ceremony, putting their upcoming marriage in the hands of God, and thanking for the opportunity of having all their loved ones together that night. The ceremony, portraits, and reception were a continuous celebration of love, family, and friendship. Happiness with no frills, and a great party. It was amazing to capture such a special day, and I'm glad I get to share it with you! I've been following Camille's photography since her early beginnings when I was still in High School. I remember telling her 4 years ago "Camille, I don't even have a boyfriend, but when I do and I get married, I want you to be my photographer". Four years later, Camille was the first vendor we had booked before the venue, or anything really. I did not care where we had the wedding, I wanted Camille there! I've seen her growth through the years, and really her photos only get better and better, making you fall in love with every single couple. The process of booking her was super smooth. We set up a FaceTime session for her to meet us as a couple and right away we knew Camille was the person we wanted to cover our special day. She was extremely flexible in setting up meetings and helping us by recommending other great vendors we hired, and talking to us during late hours in Puerto Rico when we had a time difference. The day of the wedding, Camille showed up early with her assistant and got right to work. She was great dealing with our crazy families, half who spoke just Spanish, and half who spoke just English! Her genuine care to capture those very special moments were definitely noticed in the photos. Just like she promised, after a week, we had access to our beautiful gallery and we were both extremely happy with the result. Camille has an amazing talent and the photos of our event look like what it was: a fairy tale. My advice to other brides, look no more! Camille has the talent and personality to capture your wedding day like no one else. So thank you Camille, thank you for loving what you do and for giving us such beautiful memories in amazing story-telling photos.